Inventors and engineers have for too long wasted time studying the Earth's oceans and the universe, creating inventions we can't even use. Which is why we raise our glasses to those oft-overlooked pioneers of advancement who have concentrated on the technological advancements in things that matter, such as beer and beer-drinking accessories. These are the innovative next-generation beer gadgets you didn't know you needed. Never again will your online gaming be ruined by warm beer. 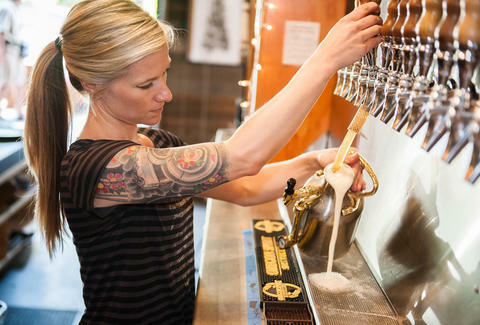 The problem with growlers is that they lose carbonation and are prone to oxidation right when they leave the tap line, causing cardboard-flavored flat beer. The Oregon-based GrowlerWerks may have cracked the code. 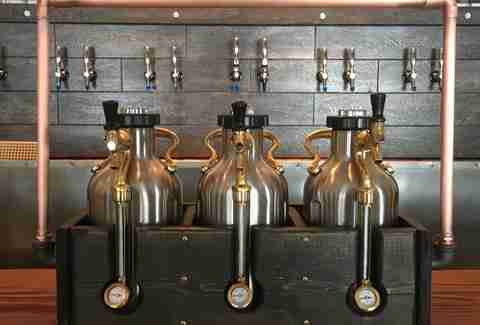 It's not the first or only company to figure out how to pressurize the beer in the growler, but it is the first to design a cool steampunk silver-and-brass growler that has its own connected draft-beer faucet, C02 cap, and sight glass. The idea was so good that the company raised over $1 million to make the prototype a reality. Now over a year since the successful Kickstarter bid, GrowlerWerks has 64oz growlers and 128oz uKegs hitting the market. Saving the world one earth-cooled beer can at a time, the eCool fridge uses the naturally cold temperatures in your backyard or campground to keep your beer chilled. It also has a pretty clever lever conveyor system that reaches underground to cycle beers out of the bottle cap-shaped top. 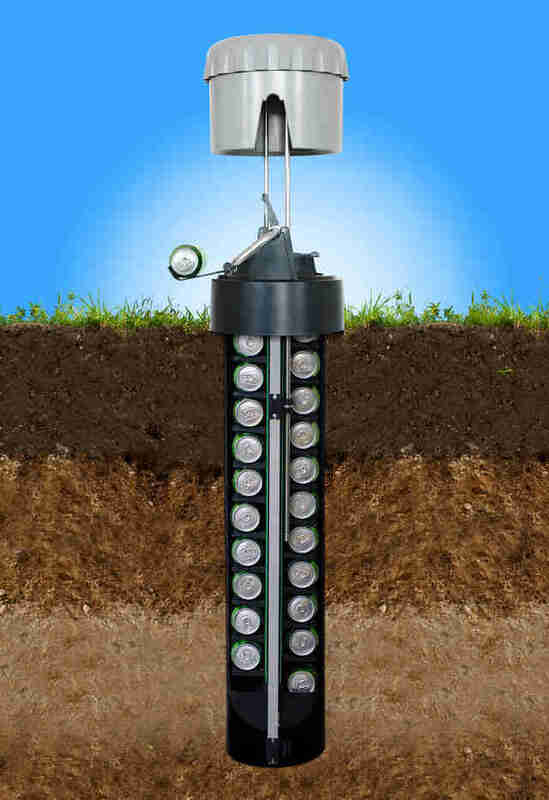 You can permanently install the eCool fridge underground in your backyard for year-round cold beers that do not need any electricity source or ice to chill. It even stays frost-free in the winters so you can hide a 12-pack underground in case of nuclear winter. 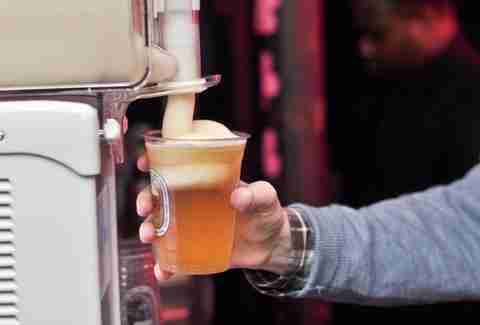 7-Eleven Slurpees are OK and all, don’t get me wrong, but I always felt they were missing something, but couldn't quite put my finger on it until Kirin invented the Frozen Beer Slushie Maker. Now I realize what was missing my entire life thanks to this thing, which completely eliminates the need to just dump a shot in a Slurpee. Now there is a reason to save your old beer bottle caps (other than that home bartop that you are never going to finish, so stop hoarding). Instead, annoy your family, friends, co-workers, small animals, and neighborhood children by shooting beer caps at them with the incredible accuracy of a sniper with beer breath thanks to this thing, which looks like a box cutter, functions as a bottle opener, and fires caps up to five meters. 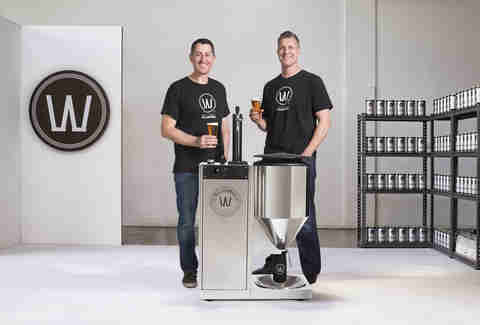 Unless you're one of the lucky ones gifted with the rare auto-brewery syndrome, you probably don't have an automated mobile fermentation system brewing beer for you at the push of a button. That is, unless you’ve purchased the computerized countertop PicoBrew Zymatic to brew from you kitchen with minimal prep and almost zero brewing knowledge. We can't all be bearded hipsters who do things "the hard way," making nano-sized batches of peach pumpkin ale, after all. For that hophead who feels that Dogfish Head's Hoo Lawd 658-IBU IPA is just not quite hoppy enough comes the Randall Jr. Developed by the same brewery that developed Hoo Lawd, the Randall was an early creation of founder Sam "More Hops" Calagione that infuses any beer with a second dose of whole-cone hops by running the beer from the tap through a separate filter before hitting the glass. Previously only owned by select bars, Randall Jr.’s now available to you, the consumer. It can be used for any beer -- run a PBR through it to add a huge hop flavor and nose or give your favorite hoppy beer even more of a punch. 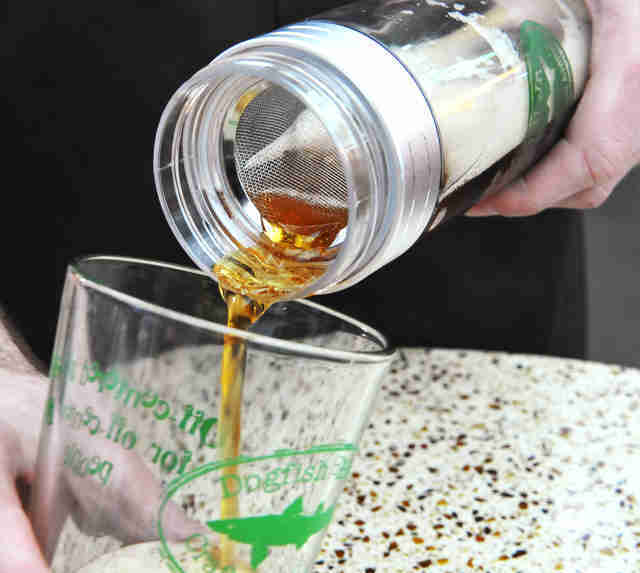 You can play with different hop varieties and even add non-hop ingredients like coarsely ground coffee or fruit for infusions from keg to glass. Good head is as important in beer as it is in life. The Sonic Foamer uses arousing, gentle sound waves to massage an explosive, cascading, and rocky head out of your glass of beer. The effects are similar to pouring a nitro Guinness, and it’s fun to watch the jolt rock the carbonation in your beer like an ocean wave smashing against the rocks of your supple lips. See? It is arousing! 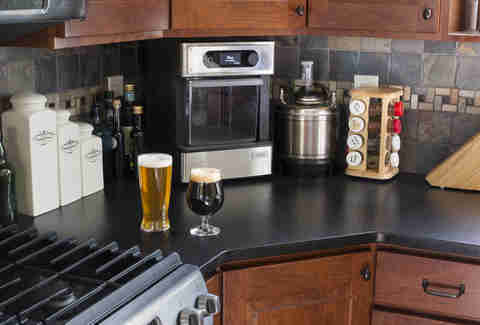 If you don’t have the space for your kegerator -- or your significant other is a total buzzkill -- then SYNEK’s countertop draft system is just what the doctor ordered. It’s sleek enough with its brushed steel door and glowing blue LED controls to keep your feng shui in check, and allows you to take home brewery-fresh beer without committing to a full keg or drinking it all in one sitting. SYNEK has developed its own system of mylar bags, fillable with a simple hose that it gives free to consumers and breweries to fill the bag with pressurized beer direct from a tank or tap. It’s surprisingly simple, and infinitely delicious. 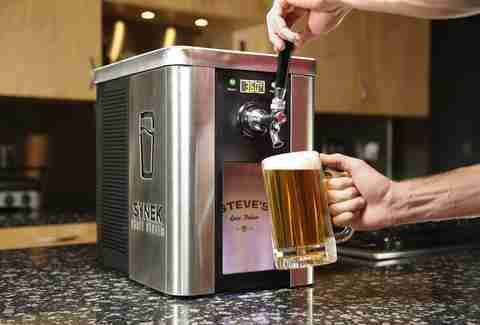 This New Zealand company has crafted a shiny all-in-one nearly automated homebrewing system for the rich guy. The Personal Brewery allows you to turn around a beer from brew day to draft in just seven days, and all the components are built in, right down to a serving tank and draft tower. It features three different brewing levels (beginner to advanced), and even has ports to bottle or keg your wares. Or you could just pull the tap and drink it up. That’s a lot easier. 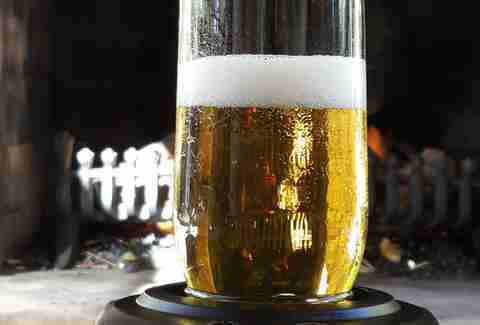 Keep your beer cold while never having to leave that overnight game of Warcraft with the USB-powered beer chiller. Simply plug into the back of your computer and place your glass or can on the metal placemat for cold beer 24/7. The company is not responsible if you wreck your computer during a beer-spilling fit of rage as you're felled again by a 9-year-old Orc lord. They say it’s the simple things that make you happy, and if that’s true then the BROpener's one-piece bottle opener that can be placed and attached to nearly anything leaves my life fulfilled. Attach one of these small metal bottle openers to wherever you might need to crack a beer: In my case that’s every room of the house, plus three each in the bathroom and bedroom. Unless you're a kung-fu master of the 99 Ways to Open a Beer Bottle Without a Bottle Opener than you will find the BROpener just as simple and convenient as I have. Good ol’ German engineering does it again with the Hermetus Bottle Opener & Resealer, which makes it possible to pop the top off your favorite brew and reseal it with the same handheld device. 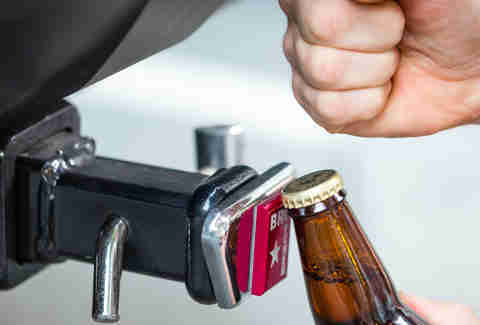 This simple two-piece bottle opener looks strange, but is magnificently simple. 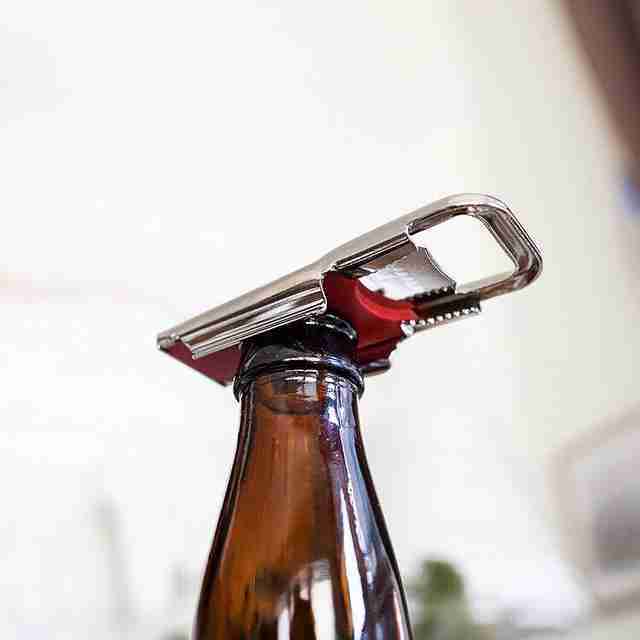 With one end you leverage the cap off, and the stiff-but-flexible rubber coating on the inside allows you to slide the frame over the beer bottle opening to create a tight seal. It doesn’t fit all European bottles (specifically the corked ones with lips bigger than Mick Jagger), but all standard American beer bottles fit perfectly. As a skeptic I slid this bottle sealer into place and turned the bottle completely upside down with absolutely no leakage. It will also help to leave some carbonation in an already-opened beer if you want to seal it and put it back into the fridge for the night. Why you would do that is between you and the beer.